Family-owned and – operated on Stearns Wharf since 1981, Nature’s Own Gallery is featuring a Crinoid fossil plate this month. After almost 38 years on Stearns Wharf, Nature’s Own features shells, fossils, minerals, jewelry and gifts from around the world. Judi ventures out every year to find the best the world has to offer, she has just returned from a buying trip and now the store has been restocked will hundreds of new items. 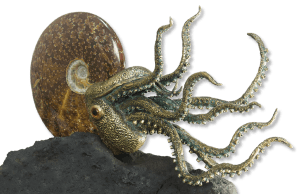 This year’s finds include a 420 Million year old Crinoid fossil plate, and a 350 Million year old Ammonite that has been transformed into a Large Squid sculpture. 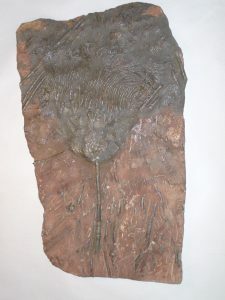 The Crinoid fossil plate is from the Upper Silurian period. Crinoids are filter feeding sea animals (not plants) which attached themselves to the bottom of the ocean with a stalk. They are echinoderms and related to starfish, sea urchins, and brittle stars. Crinoids where animals which were rooted to the floor of the ocean by a stem and had many armored feeding arms which they used to filter the water for food. They first appeared in the Ordovician period and are still alive today. “Beautiful fossils are becoming harder and harder to find, so when I see one that stands out from the rest, I always bring it back for everybody to see”. This highly detailed Scyphocrinites crinoid dates back to the Upper Silurian period and was discovered near Erfoud Morocco according to Judi. The shop also features shells, coral, amethyst geodes, fossil Megalodon (shark) teeth, and unique jewelry pieces. “Nature’s Own Gallery is the place to go to find that special gift for yourself or for the person that has everything”, said Mrs. Bruskin. Mrs. Bruskin says “Where else can you see or buy fossils millions of years old, beautiful minerals, or dinosaur dung? 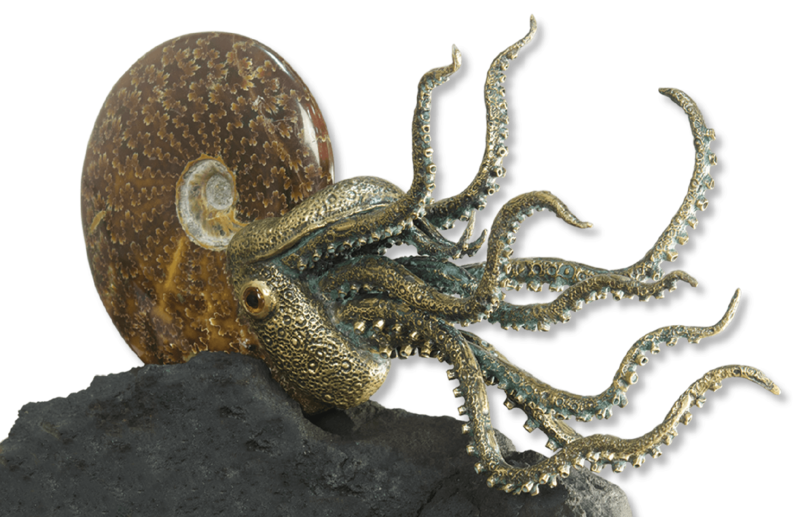 I hope everybody comes in to see our fossils, amethyst geodes, and beautiful mineral jewelry”.